As the mother of the bride, you need to be stylish, sophisticated, and beautiful for your daughter’s big day. If you’re buying this for your mother as a gift to wear at your wedding, you’ll want those same qualities for her. While she might sit back and let you make all the decisions, she’s as invested in this day as you are. It’s the day her little girl gets married. These pretty brooches for the mother of the bride will be a terrific addition to her outfit as well as being a possession she’ll keep forever to remember your big day. 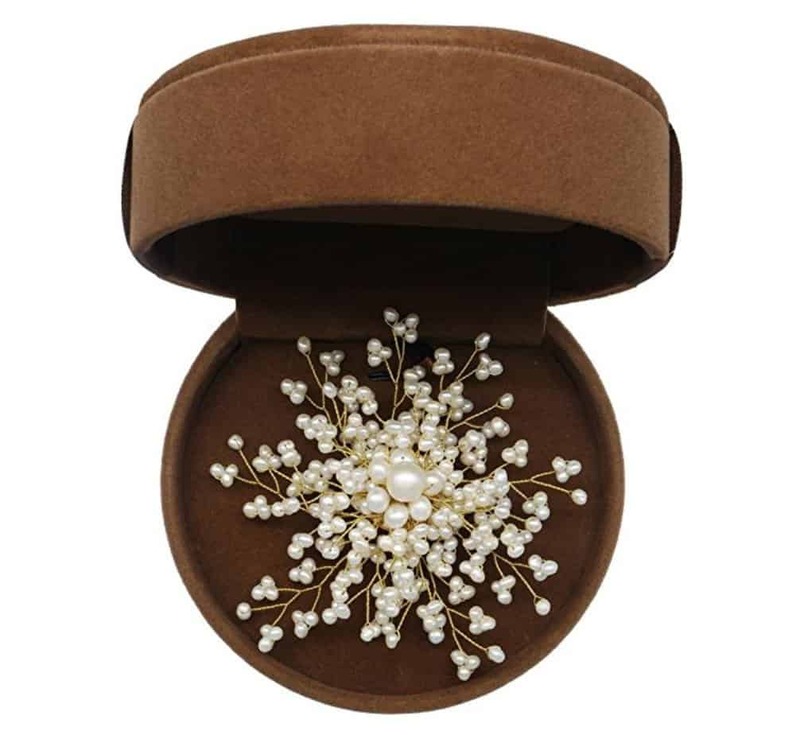 The brooch from Tian’s Pearl is a stunning piece that fits perfectly with a wedding. It’s available in a few different color hues and pearl shapes. There are rounded white pearls, which are the traditional ones people know and love. There are also long white pearls, flower colored and purple pearls. You’re likely to find a color that will match the theme of the wedding if it’s a light pastel shade of pink or purple. The pearls vary in size from large in the center then trickling out to the smaller ones on the edges. It’s held with twisted sterling silver. 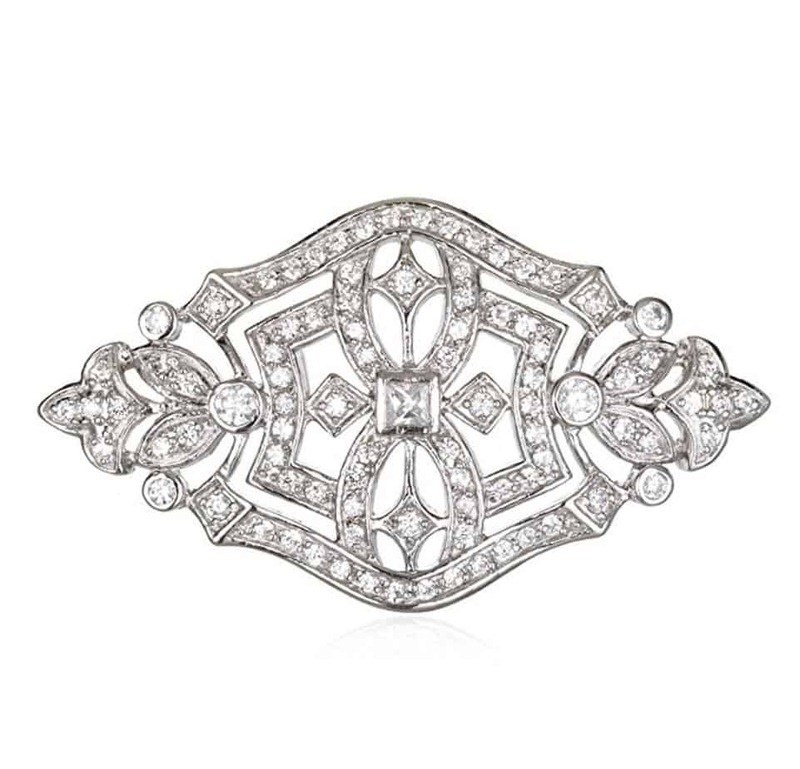 This brooch would make a stunning gift for the mother of the bride on her daughter’s big day. 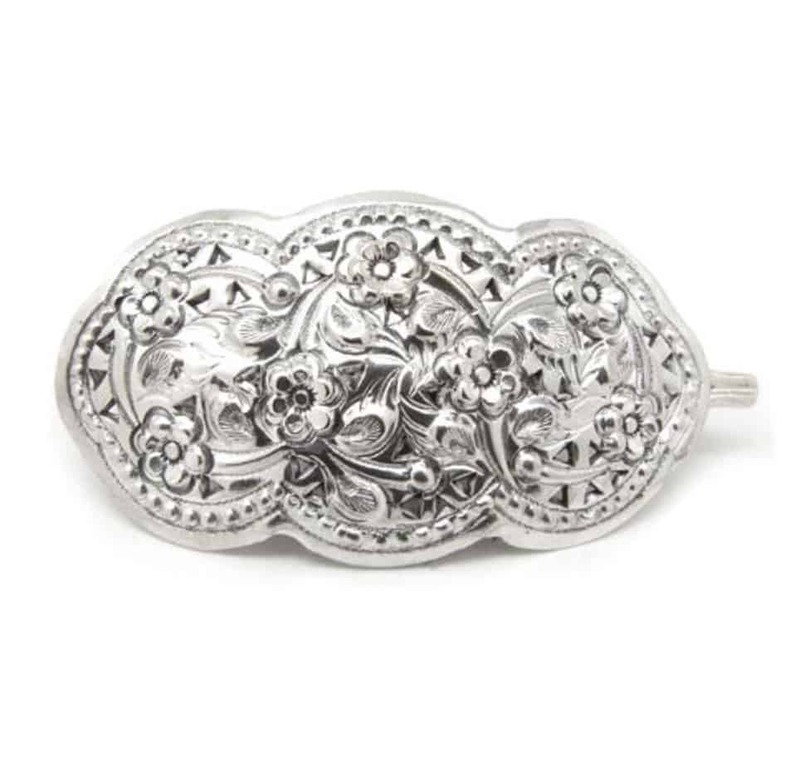 The sterling silver marcasite pin weighs 11 grams. On the back of the pin, it’s stamped with 925 Sterling. The brooch measures 78 mm long and 30 mm wide. 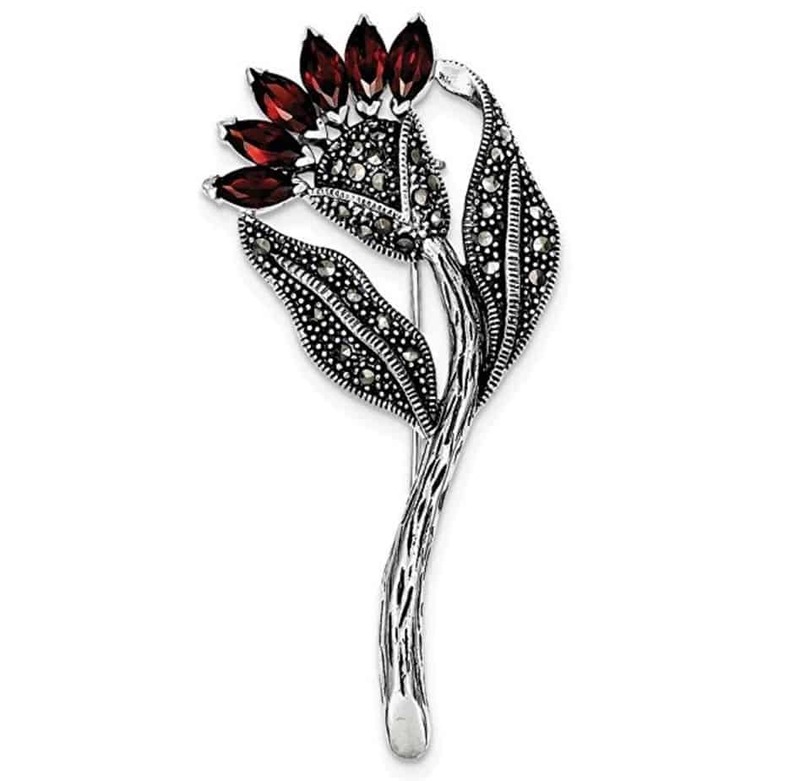 This beautiful flower from Jewels Obsession has 6 marquise cut red CZ stones. It comes with a blue box stamped Jewels Obsession for easy gifting. The mother of the bride will appreciate the stunning beauty of this brooch for her little girl’s wedding. This unique pin can be used in a variety of ways. It’s a beautiful piece that can be used as a pin or a hair clip. In fact, a mother and daughter could purchase two of them to wear at a rehearsal dinner or the event itself. The MOB could wear it as a brooch while her daughter wears it styled in her hair with the train leading from it. The pin is 2.5 inches long and 1.375 inches wide. It weighs 16.4 grams and is 925 sterling silver with the markings. The style is vintage Victorian, which is perfect for weddings that are a bit more traditional. This pretty pin is in the shape of a circle with baguettes. It measures 37 mm in diameter. The metal in this pin is 925 sterling but it’s covered with rhodium plating to enhance the shine of the metal. The white baguettes are Cubic-Zirconia in a very good cut with a minimum color of white with a good polish on them. They’re simulated to appear like diamonds without the massive price tag of real diamonds. The mother of the bride can wear this pin to the engagement party, rehearsal dinner, or the wedding. It’s a stunning piece without being overpowering, and ships with it’s own jewelry pouch for gift giving. Synthetic Cubic-Zirconia is patterned into a shape of a bow to surround a beautiful freshwater cultured pearl. The metal is 925 sterling silver. The metal weight is 6.71 grams. The pearl is a round white piece surrounded by white, synthetic diamonds that haven’t been treated. This pretty brooch for the mother of the bride will look fantastic for any of the wedding events when she has to look her best. For a woman who loves antique fashion jewelry, the mother of the bride will adore this pin. If the bride is having a vintage-inspired event, this pin is perfect. It’s rhodium plated sterling silver with a .925 stamp. The plating gives it an extra shine. Vintage doesn’t have to mean dull. The design of the pin is vaguely Art Deco, which was a great style in the 20s. The pin measures 29 mm in length and 5.3 cm in width. 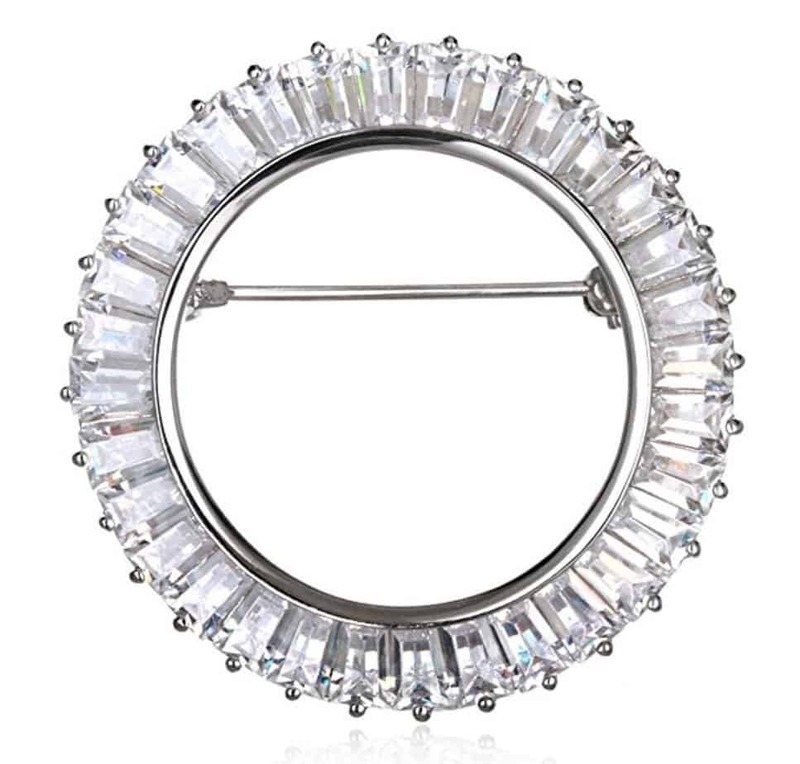 We saved the best for last with the sterling silver brooch from Caratera Fine Jewelry. 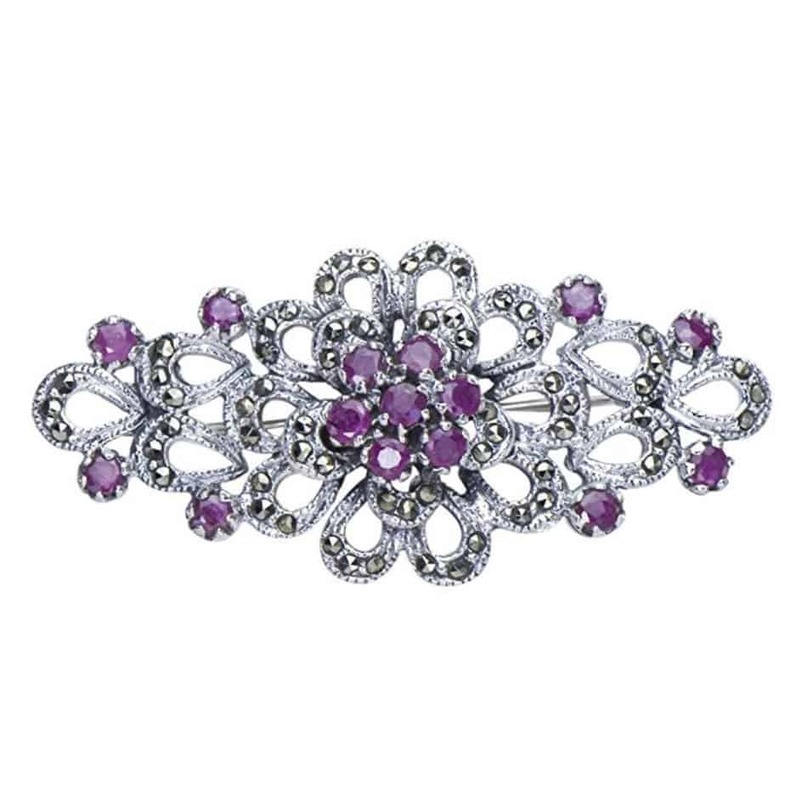 The brooch has stunning rare African Ruby Marcasite gemstones. The gems are brilliant round cut and beautifully decorate this stunning sterling silver design. They’re natural red gems in an ideal cut. The entire brooch measures 2.17 inches by 1.02 inches. We love the intricate design of the silver as well as the floral pattern of rubies in the middle of the brooch. 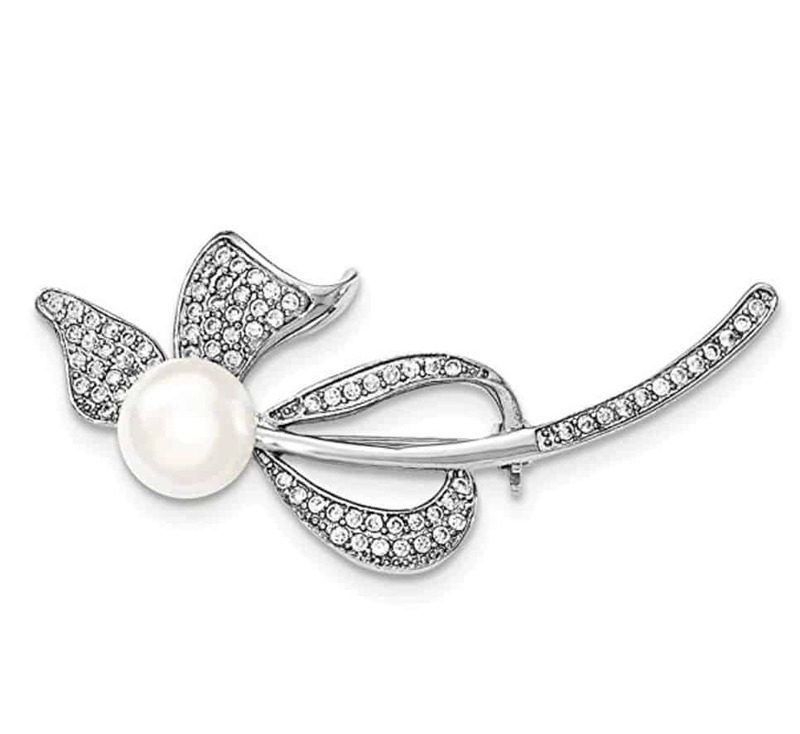 It’s a delicate, pretty brooch that the mother of the bride will love. We had a hard time deciding on the prettiest brooches for the mother of the bride. It’s a huge event in her life as well as her daughter’s life, and she’ll want to look her best. Any of these brooches will look great on her. If you’re buying one of these as a gift, consider buying more than one since she’ll need to look stunning at the wedding itself but also the engagement party and rehearsal dinner.